What will your box include? 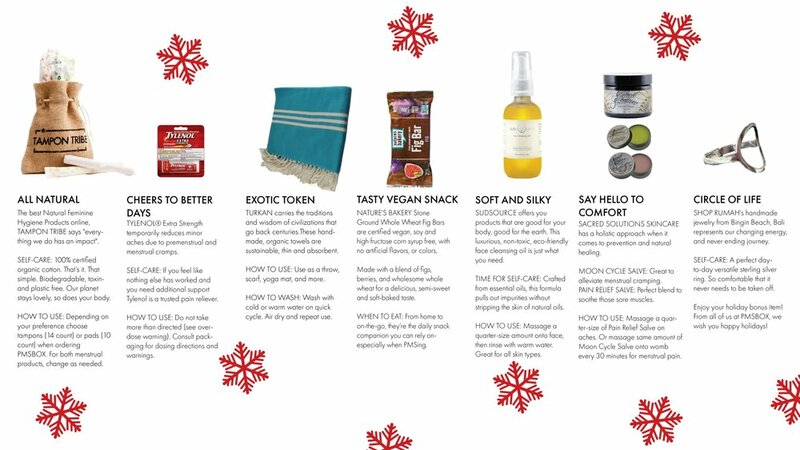 PMSBOX is a monthly subscription box that includes four items plus a bonus token gift to improve your menstrual experience. With every box purchased, we give one box of menstrual pads globally to those in need. According to the United Nations, Menstrual Hygiene is a global public and human rights issue. 1.2 billion menstruators still struggle today to fulfill their basic needs of accessing hygiene products. The team at PMSBOX has come up with a simple yet effective way to raise awareness, and meet our Goal: Reach 10 million menstruators in need. With a ‘one-supports-one’ model, PMSBOX began shipping to subscribers, and delivering to recipients on December 22, 2018. For each box that is purchased, a box of menstrual pads are sent globally to those in need. PMSBOX Founder & CEO Sera, and PMSBOX COO Damla are originally from Turkey, and have experienced firsthand the lack of feminine hygiene supplies available in their home country. Let’s end period poverty, together! “I can’t say how excited I was to get my PMSBOX. I’ve seen other PMS products, but nothing beats PMSBOX. I love everything about this little box. The packaging is very cute in its own way and convenient. They give you options between organic pads and organic tampons which is great. Every month they surprise you with different menstrual products which is very creative and unique. They provide everything, pads, pain reliever, beauty supplies, nutrition, and a beautiful sterling silver ring which is one of my favorites. I use sudsource face cleansing oil everyday. It’s amazing. “As a girl who tried to trick the system, I altered my birth control so that I didn’t have a monthly period. After deciding to stop hormonal birth control, I definitely felt the wave of PMS and it hit me unlike before. The most impressive part of opening the box wasn’t the contents inside, but knowing that with every PMSBOX purchased, they give menstrual supplies to a woman in need. I quickly thought back to how I was able to easily manipulate my cycle without worry while there’s women all over the world who don’t have that option and don’t even have the necessary products to get through their cycles comfortably. In the box there was a postcard that read, “Enjoy your box packed with happiness and good vibes.” I certainly felt the good vibes as I opened the package and hearing their mission. Inside includes everything you’d need to survive and practice self-care during your period.